Because it’s the end of the growing season, and gardeners probably have an overabundance of tomatoes, I thought I would share this again. 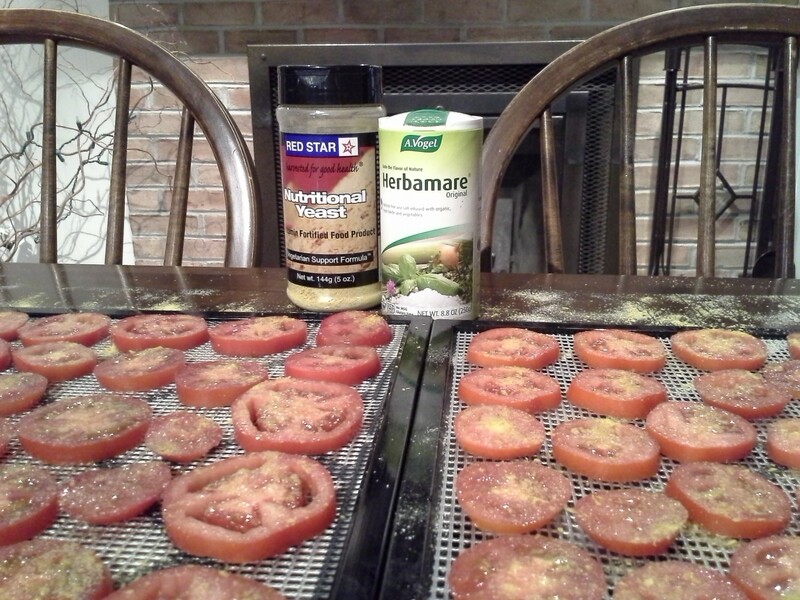 I use these tomato chips in place of sundried tomatoes all year long. Delicious! This is the easiest way I have found to preserve your abundant tomato harvest. Only two ingredients besides the tomatoes, and so simple! The first thing you will do is thinly slice the tomatoes — not more than 1/4 inch thick. Spread the slices in a single layer on the dehydrator mesh tray making sure the slices are not touching each other. There is no need to line the tray with a teflex sheet or parchment paper. Lightly sprinkle each slice with a little Herbamare (or any sea salt and herb seasoning you desire). 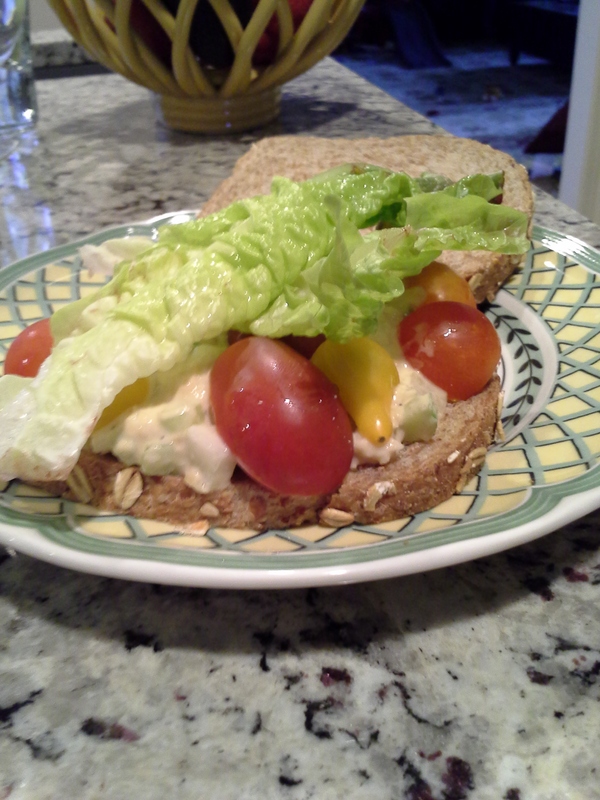 Then top with some nutritional yeast. 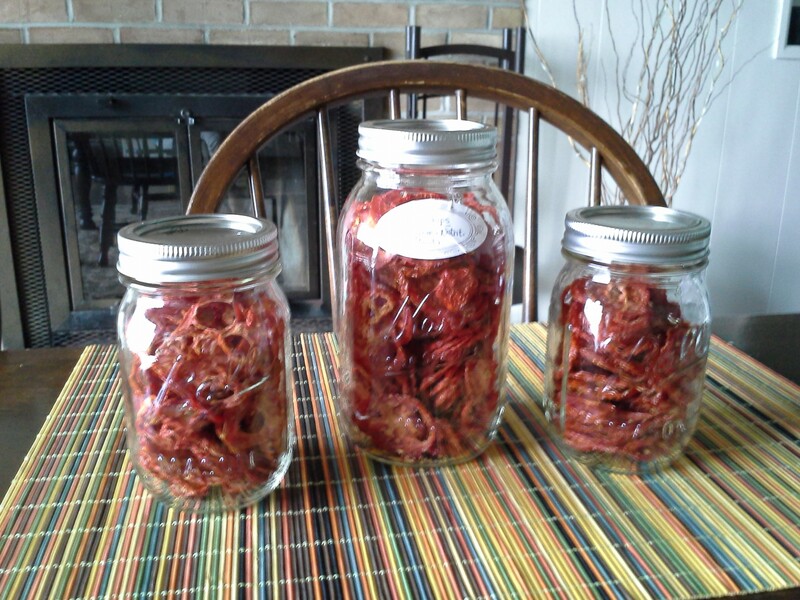 Dehydrate for 6 – 8 hours or overnight. Store in a tightly covered glass jar in the pantry, and they’ll stay crisp all winter. What is the perfect dinner for a cold winter evening? 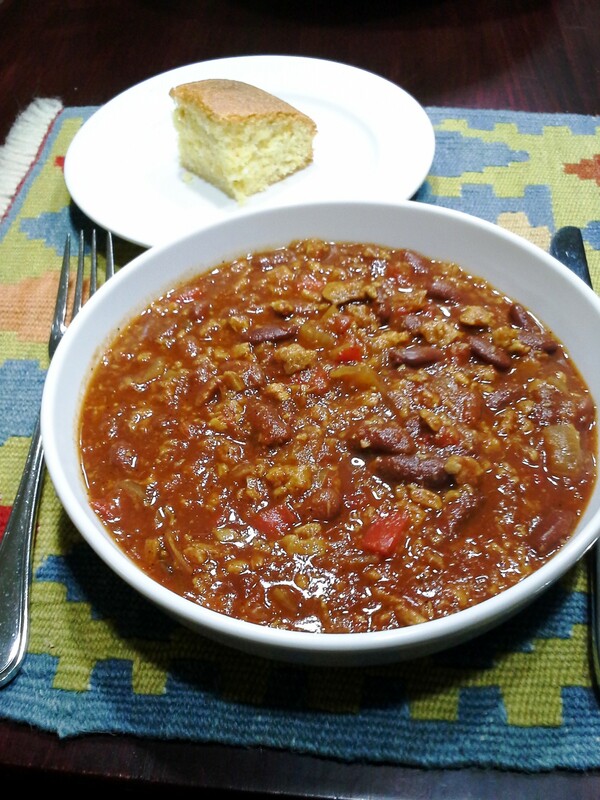 A steaming bowl of heart healthy chili! This recipe will provide mega protein and fiber with very little fat and calories. It’s a very simple recipe made with common ingredients, and is delicious with or without the optional ingredients. As a bonus, you can also throw everything in your crockpot and let it cook on LOW all day. Dinner will be ready when you return home! Cover and simmer all ingredients for 45 minutes, stirring occasionally. We call this cereal, but it’s really a salad disguised as breakfast. 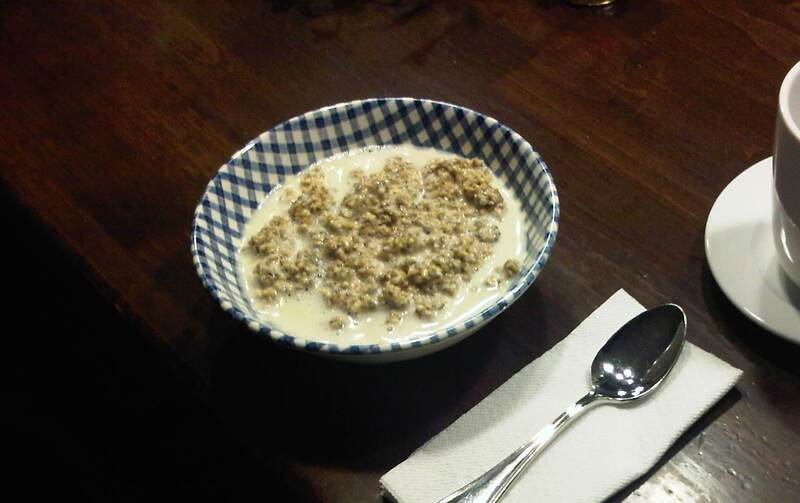 It’s the strangest and healthiest breakfast cereal I have ever LOVED! This recipe doesn’t contain any actual cereal at all, but oddly enough, it does have a granola-like texture and taste. I promise, it is really good — the teenagers in our house have been known to eat three bowls full! This simple recipe makes enough for several generous servings and will keep in your refrigerator for a couple of days (if it lasts that long). 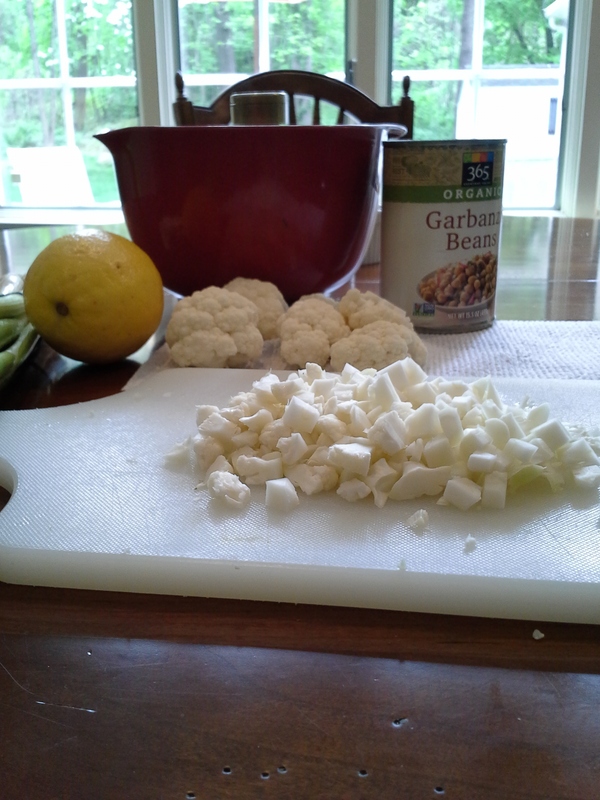 Cut vegetables into chunks. Chop carrots for about four seconds in food processor. Add other ingredients to processor and pulse until desired texture is reached (pieces about the size of granola). That’s it — wasn’t that easy? Pour all in a bowl, and top with maple syrup (or sweetener of your choice) and pour almond or soy milk over top. Optional: Sprinkle raisins and/or cinnamon on top. In a perfect world I would wake up early each morning to make a hot breakfast for my family before sending them out into the cold, but in reality I am NOT a morning person. When I saw this recipe in Vegetarian Times magazine I knew it was created for people just like me and simply had to share it. It can all be assembled the night before and requires NO COOKING, yea! The spicy chai flavor is wonderful, too. Combine oats, “milk,” chia seeds, cardamom, vanilla, ginger, cinnamon, nutmeg, black pepper, and maple syrup in a glass jar with a lid. Stir, close, and refrigerate overnight. The next morning just open lid, stir, and serve sprinkled with coconut and pistachios if using. I served it with sliced bananas and a little added almond milk instead, and it was delicious! If you desire you may warm it slighty before serving. Makes 2 one cup servings at 270 calories each. You can find more great recipes at http://www.vegetariantimes.com. It’s almost Christmas, and you still want to make some cookies — but they have to be vegan…and healthy…but still taste great. Hmm, this recipe can meet all those requirements and your friends will ask for the recipe. You can feel good about serving these raw cookies, and you won’t spend all day in the kitchen either; quick, easy, and delicious! Soak dates and cranberries in distilled water (just enough to cover) for 2 hrs. Grind oats in food processor until fine. Drain dates and cranberries. Add remaining ingredients and process thoroughly to form a dough. Roll into small balls and roll each ball into more almond meal. Refrigerate until serving. Keeps up to two weeks in the frig. * This is a very versatile recipe. I have substituted dried cherries for half the cranberries, and you could probably use half light raisins, too. 1. SPRAY: Put all ingredients into a spray bottle and shake gently to mix (it will foam). Spray on vegetables or fruit and allow to sit for 2-5 minutes, then rinse with cold water and dry. 2. SOAK: Fill a clean basin or sink with cold water. Add vinegar and salt, then stir until salt dissolves. 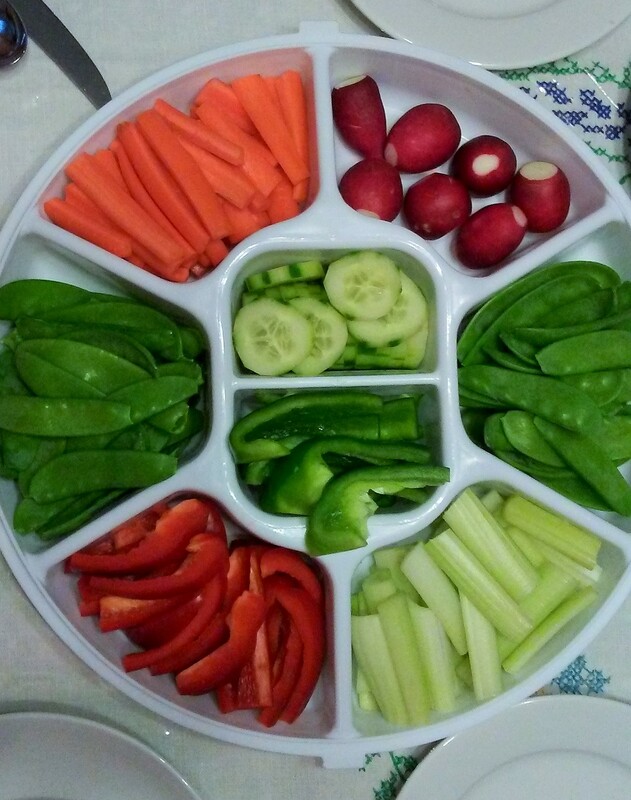 Place vegetables or fruit in sink and allow to sit for 25 – 30 minutes. Rinse under cold water and dry. These ideas came from http://www.food.com where you can find even more great recipes and money-saving hints.